Day 2 Photos by Didier Hillaire / Yacht Club de La Grande Motte . Full album here. 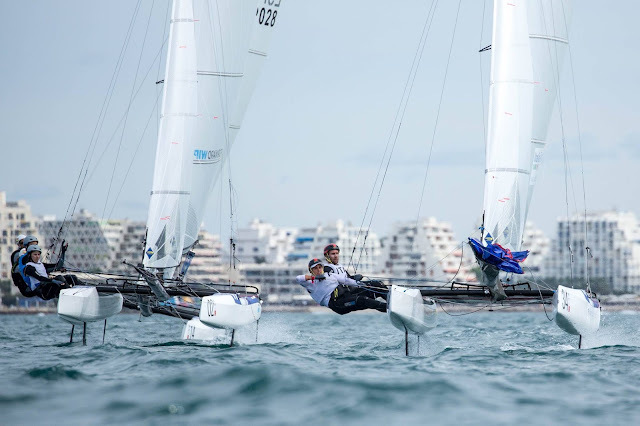 Building conditions today at La Grande Motte, they finished the day racing with +20 knots in one of the courses. 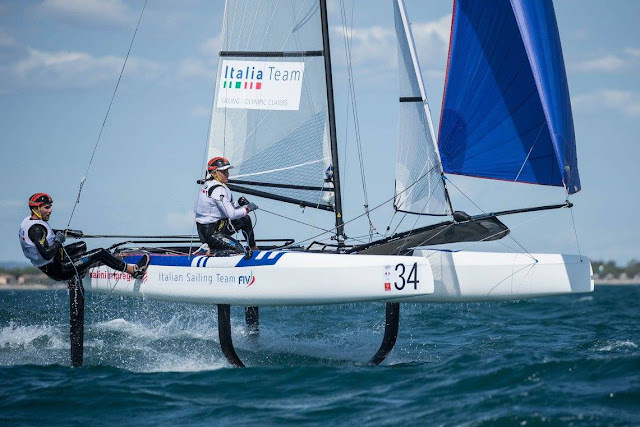 Best crew of the day were Vittorio Bissaro & Maelle Frascari , scoring 1,2 & 3 in the breeze, their course also had more waves that the other fleet. European winners Ruggero Tita & Caterina Banti also had a great day with 6, 1, & 2 putting them in 3rd overall for the event. Leaders after 6 races are Lin Ea Cenholt & Christian Lubeck who keep scoring top 5 results to share the overall pts with Ben Saxton & Katie Dabson, currently in second place overall. 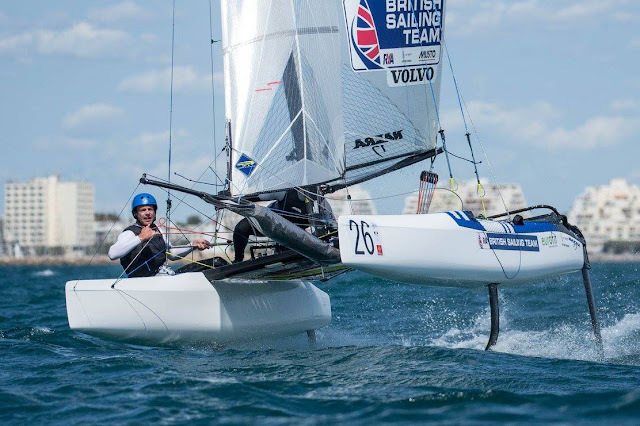 Silver medalist from Rio, Jason Waterhouse & Lisa Darmanin improved today with more wind and climbed to 8th overall. Lange & Carranza started the day with a bullet, and 8th & 6th later to stay within the top ten. The Arg kids had an excellent first race saling along Bissaro-Frascari for but a 9 & 14 left them momentary in 12th place. Still from all the top 10-15 crews, I think they received the MKII the latest. Much left but so proud of these kids racing 1 to 1 already and so early in their project towards Tokyo 2020. Official report can be read at official Championship Fb web , also below results sent by Nacra 17 Class. On the coverage still wondering how an Olympic Class Worlds does not has tracking while at the same time the Class had excellent coverage the Europeans this year (best we've seen) , tracking included. 3 races held today. Provisional Top ten after 6 races, more info & pics later. Full results here. breeze kicked in for the afternoon. 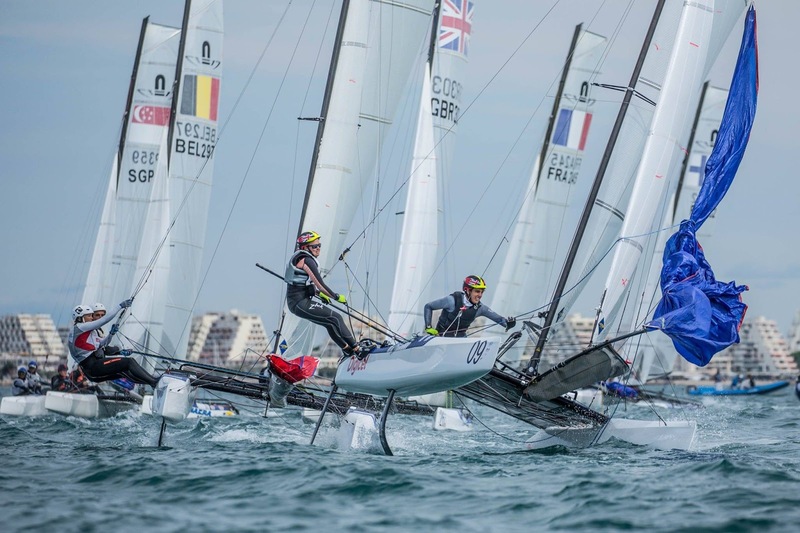 A solid 3,4,4, for the day from Denmark’s Lin Ea Cenholt Christiansen and Christian Peter Lubeck moved the Aarhus 2018 World Championship Test regatta winners six points clear of Great Britain’s Ben Saxton and Katie Dabson. The Tramontane took its time to build. Racing got away in a modest 8-9kts for the first qualifying heats of the day for both fleets before an enforced break waiting for the forecast breeze, which could be seen tantalisingly close, hovering to the west of the large, open bay before it the white horses of the Camargue finally lined up to produce two excellent contests, taking many of the crews to the edge of control, learning finer points of the processes and pitfalls of the different foiling modes. The cross offshore breeze had enough reach to windward to kick up some challenging waves at times. 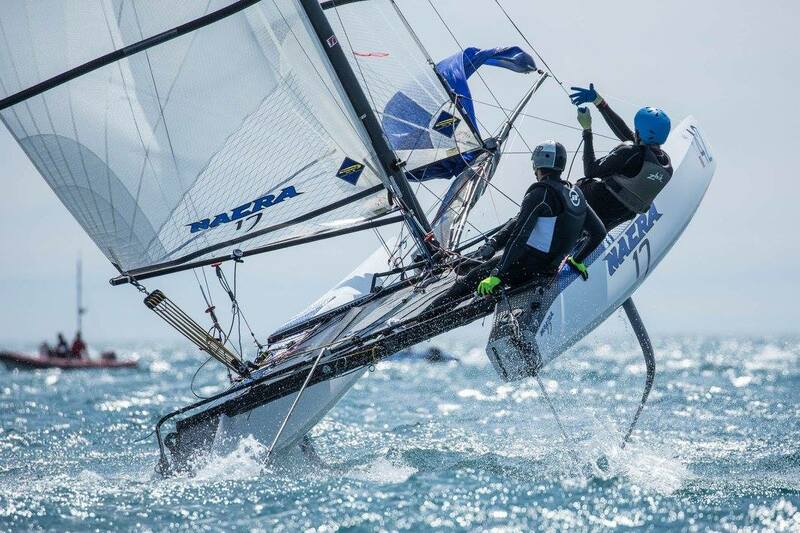 It was good day for the strong Italian Nacra 17 squad who started their ascent of the leaderboard. 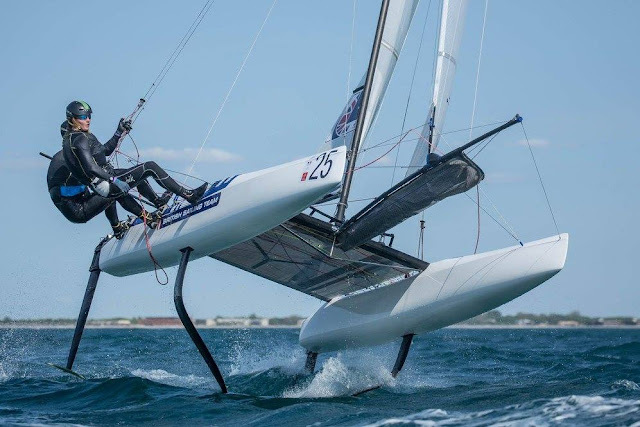 Recently crowned European champions Ruggero Tita and Caterina Banti, universally acknowledged as among the fastest teams upwind, bounced back from a bit of a lacklustre first day with a second and first gained as soon as the breeze was in, to move up to third. Best scores of the day came from compatriots Vittorio Bissaro and Maelle Frascari who sailed to a 1,2,3 after three midfleet results on Tuesday. Rio gold medallists Santiago Lange and Cecilia Carranza Saroli capitalised in the first race after an excellent pin end start to put themselves in a position to pounce when the regatta leaders made a mistake at the second top mark. 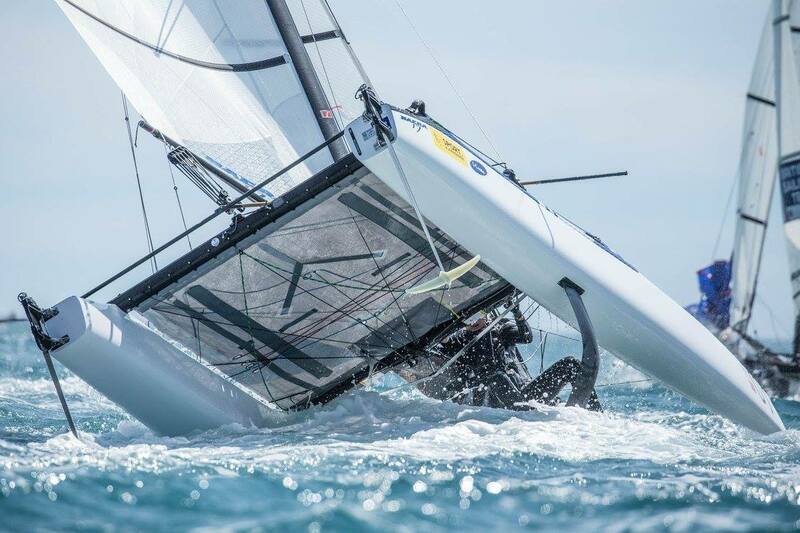 Helm Christiansen fell off the boat as she completed a swift tack at the mark in front of the Argentinian duo. They sailed past to take their first winning gun of 2017, their first victory together since Rio. Their second race did not go so well as their main traveller broke on the approach to Mark 1, compromised thereafter they finished eighth. With a sixth in the third race Lange and Carranza Saroli are now up to tenth. “We were top three when we dropped the traveller down and it went ‘bang’. That is a mistake. Every race counts a lot for us for our confidence. I enjoyed the day, it was good fun and we are learning together race by race. Today we learned how much we really have to catch up after my injury. I damaged my ligament in my knee reaching on Garda when Santi fell on it. We had sailed for ten days and then I was out for three weeks. So it is good to be back.” Recalled Saroli. For Spain’s double Olympic medallist Iker Martinez, lack of training time in the Nacra 17 may be compensated for by sheer experience, a clear head and focus and the sheer drive promoted by missing out on Rio selection. 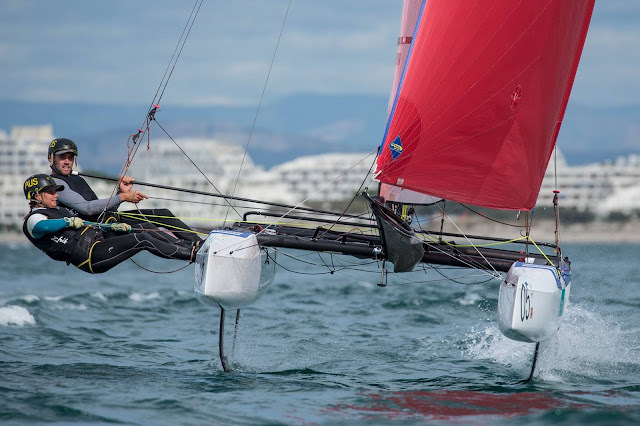 Now having been sailing for six months with Olga Maslivets, Martinez explained they have done little training since the Iberostar Princesa Sofia Regatta and missed the Europeans, but they have done some Moth sailing and he has been busy with the GC32 circuit racing.